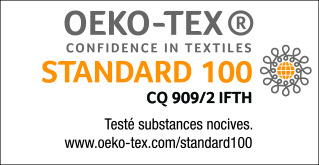 certification made by independent laboratory and institute. Class II: textiles which, when used as intended, have a large part of their surface in direct contact with the skin (e.g. underwear, bed linen, terry goods, shirts, blouses etc...). Most of our products gets the Oeko-Tex® 100 certificates.